Three young New York brothers are ordered to stay away from the U.S. Capitol and must perform community service after being arrested outside the U.S. Senate chamber earlier this week. But the brothers say that it was a terrifying misunderstanding after they got turned around outside the Senate chamber and that police are to blame for the breach. Police reports obtained by the News4 I-Team said the brothers were stopped Monday after entering a restricted area — and once questioned by authorities, claimed to be staffers for Senate Democratic leader Charles Schumer, of New York. Prosecutors said they charged Tyler Fritzhand, 22, Troy Fritzhand, 20, and Bradley Fritzhand, 18, of Great Neck, New York, with unlawful entry. According to court records, a U.S. Capitol Police officer spotted the men walking through the Ohio Clock Corridor outside the U.S. Senate, without staff identifications. 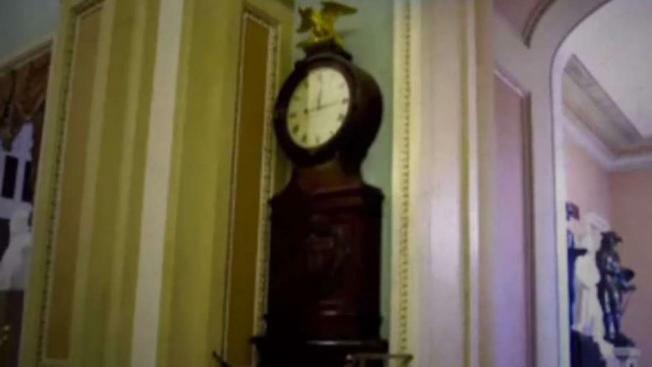 The Ohio Clock Corridor, which is adjacent to the Senate gallery, is restricted to credentialed congressional staff and reporters and is regularly used by senators for press briefings. After the officer asked for their credentials, the men each stated they worked for Sen. Schumer, according to the police report. Police determined the brothers have no connection to the senator. Pressed by a police officer about how they were able to access the restricted area, one of the men acknowledged they were able to bypass other security barriers inside the Capitol in part because they were “dressed” to appear as if they were congressional staff, according to the police report. Police later arrested and booked the men at Capitol Police headquarters. But Troy Fritzhand told the News4 I-Team that he and his brothers were on the Hill Monday to promote their business — a tech company aimed at tightening election security — not to cause trouble. He said they had scheduled with a number of legislative aides and then watched Senate proceedings from the public gallery. Troy Fritzhand said they took a wrong turn when trying to exit and they felt pressured by police to say they were congressional staffers to avoid arrest. “It seemed like it was a clear breach of protocol on the Capitol Police’s part, and they took it out on us,” Troy told the I-Team. “We are just three kids from New York who had never done anything wrong in our lives and we were treated like we were international terrorists,” he added. The men received a deferred prosecution agreement this week requiring them to perform 32 hours of community service. They were also ordered to stay away from the U.S. Capitol except for verified appointments. Prosecutors said they have reached an agreement with the men to dismiss charges in four months if the Fritzhands perform community service in the meantime. A follow-up hearing in the case is scheduled for November in D.C. Superior Court. The incident is at least the second in which an unauthorized individual gained access to a sensitive area of the U.S. Capitol. Trump didn't flinch as the airborne flags headed his way, reacting only by giving a thumbs up. The man who flung the flags — who was later arrested and identified by police as Ryan Clayton — shouted, "Trump is treason," and, “This president has conspired with agents of the Russian government." As officers subdued him, Clayton yelled, "We should be talking about treason in Congress, not about tax cuts!" U.S. Capitol Police did not immediately return requests for comment about its arrests of the Fritzhands, nor has it commented about how Clayton gained close access to the president in October. The general public is allowed inside the Capitol complex for tours and appointments, but all entrants, including journalists, must go through a metal detector. Members of the press carry photo identification that allows them to traverse the halls of the building, but journalists obtain those credential badges only after undergoing a screening.